Dog Poisoning: What All Cocker Owners Should Know! Of course you want to keep your cocker spaniel safe, but accidental dog poisoning happens far too often. Learn how to help prevent your pet from being poisoned, what to do in an emergency, and what your treatment options are. When it comes to a treatment for dog poisoning, prevention is better than the cure. We read about cases of accidental poisoning in dogs all too often; fatal accidents that could have been avoided if only a little more care and attention had been taken. We can't turn back the clock, so as responsible pet owners, we need to make sure (as best we can) that our Cockers don't come into contact with poisonous chemicals and foodstuffs in the first place. The problem is, Spaniels are naturally curious about their surroundings and are forever exploring and sniffing out new smells and tastes...and they'll eat practically anything! First of all, I recommend you make a note of your vet's emergency telephone number, as well as the normal surgery number, and keep them both handy so that if there is an emergency, you can make contact quickly and without fuss. If you think your Spaniel has accidentally swallowed a poisonous substance, don't panic. Stay calm, but move quickly. Telephone your veterinary immediately and give the following information. Describe the symptoms that he's showing, if any. Hold onto any packaging that may give the vet clues to what has been ingested. 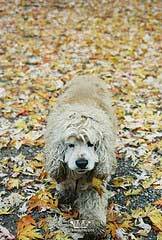 If you dog has been sick, it may be prudent to bag a little as it may help the vet make a quicker, clearer, diagnosis. Your vet may ask you to bring your Spaniel to the surgery immediately, or he may instruct you not to move him if he feels it would be safer for him to come directly to you. Why not copy this 'emergency checklist' and keep it with your Cocker's details? It could help to save your Cocker's life! 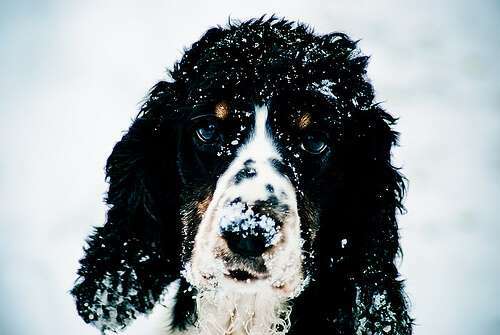 The more information you can give your vet, the easier it will be for him to work out what toxins your Spaniel has swallowed and decide what specific treatment needs to be given. Don't worry if your vet cannot diagnose what 'poisons' have made your Cocker ill, he should still be able to provide suitable treatment for your pet. The main thing is to stay calm and react quickly. I don't recommend you try any 'home-remedies' unless your vet asks you to do so, but treatment often depends on the type of poison ingested. For example, you should never induce vomiting, (unless requested by your vet) where caustic substances such as bleach or oven cleaner are involved as this will cause even more damage to your pet as the chemicals come back up. Instead, your vet may recommend giving him vinegar or lemon juice, diluted in equal amounts of water, to help reduce the burning in his stomach. (You may need to use a turkey baster to get the mixture down his throat). If your Cocker hasn't swallowed a caustic poison, (he may have swallowed grandma's blood pressure pills for example) your vet may advise you to induce vomiting to help remove the pills from his stomach before they dissolve and cause too much damage. Your vet will explain how he wants you to do this. If the poison your pet has swallowed is acidic, your vet may recommend Milk of Magnesia to counteract the effects of the acid. When you arrive at the surgery, your vet may administer activated charcoal to your Spaniel to help soak up the poisons before they are absorbed into his bloodstream. Never induce vomiting unless requested to do so by your vet. How many times have you come across a dead rabbit or badger while you were out walking in the countryside? Probably quite a few. Unfortunately, if your Cocker finds the dead rabbit before you do, decomposing fragrantly, you can bet your bottom dollar he's going to give it a big lick or two. Even worse, he may carry it off and begin devouring it! You can't be certain how the animal died, but if it had been poisoned, then your dog has too. There are also many shrubs, mushrooms, berries, and poisonous plants that your dog may unwittingly nibble on and which could harm him so it pays to keep a close eye on him while walking in the fields. Even closer to home there are many substances that can harm our pets, for example, ordinary household products such as cleaning sprays, insecticides, pesticides, fertilizers, antifreeze, and highly toxic rat and rodent poisons. Spoiled food is another cause for concern. Don't feed your Cocker anything you wouldn't eat yourself. For example, if the food is well past its sell-by date and you wouldn't eat it, or feed it to your children, don't give it to the dog. If it's not good enough for human consumption, it's not good enough for your Spaniel! Unspoiled Foods Can Cause Dog Poisoning Too! In addition to bacterial food poisoning, there are certain human foods that are harmful to dogs, some of which can be extremely dangerous and have potentially lethal consequences for your Cocker Spaniel. Believe it or not, these are normal, everyday foods that you and I eat, such as onions, grapes, raisins, and chocolate. As responsible pet owners, we should be aware of which foods we shouldn't feed to our dogs. Imagine how you'd feel if you accidentally killed your best friend with kindness! (I know, it's a bit extreme, but it gets the message across). If our pets come into contact with, for example, a decomposing animal (or rotten food), they can can easily pick up harmful bacteria, such as salmonella and e-coli, and end up with food poisoning. Some poisons are more toxic than others; the less toxic resulting in nothing more than a mild irritation and/or sickness and diarrhea, but the more toxic can cause seizures, heart or kidney failure, coma, or even death. Toxins can be inhaled, ingested by swallowing or licking, and can be absorbed by the skin, or the pads of the feet. If small amounts are regularly ingested, it's possible for some toxins to build up in the system and slowly poison your Cocker. Some poisons may be toxic only if swallowed and may not cause harm on contact with the skin; however, if your pet tries to clean himself by licking off the poison, he may well end up swallowing it and become sick. If your Spaniel is prone to epileptic seizures he may be more sensitive to poisons than he would otherwise be. You can get more help from the pet poison helpline here. The intensity of the above symptoms will depend on what your dog ate and how much of it he managed to gobble up. The sooner you get your dog to the vets surgery, the better. Dog poisoning can, and often does, happen all too easily; there will always be accidents waiting to happen. We can try to minimize these by taking a new look around your Cocker's environment. Do you see any potential hazards or dangers of poisoning? Can he easily get into the rubbish bin where he might find rotten food? Are there any pill bottles lying around? Are all chemicals locked away or on a shelf out of reach? If there's any risk to your pet, deal with it now. Above all, keep your dog safe!